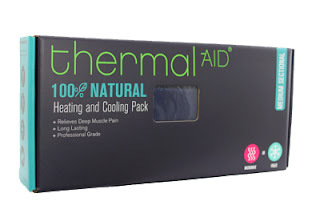 The ABCD Diaries: Holiday Gift Idea: Thermal-Aid Products! 5 new, adorable ways to make your little one's aches and pains go bye bye! "Pacific Shore Holdings expands their line of eco luxe heating and cooling bears; introducing the new, irresistible Thermal-Aid Zoo. The perfect stocking stuffer, baby gift or anytime gift. Pick from five adorable little creatures. Thermal-Aid and the it's latest collection, are pain relief products that are 100% natural heating and cooling application, that is affordable to all walks of life. Developed by Pacific Shore holdings, a company that develops products that are inexpensive that are very effective. Moreover, we try our hardest to make them as green as possible. Thermal-Aid, which is a patented heating and cooling application that was originally designed and developed for the medical and veterinarian field. With a couple of tweaks and retail packaging it has made it to retail as a very unique heating and cooling pack. What makes it different from the competitors, is it is made from a bioengineered corn product that has had all of the ingredients that are attached to a piece of corn, that would normally allow mold and fungi growth removed from the product. Then it is hydrated, super-heated which allows it to holds temperatures for longer periods of time, even longer than the products found in the medical and veterinarian field. Thermal-Aid products were then package for retail, we were featured on HSN, one thing led to another and now it is sweeping the country. The product is now available, and flying off the shelf at stores such as Costco, Walgreen’s, and various other natural food and natural product stores around the country." What we thought: The products we reviewed from Thermal-Aid worked really well. The Bear came in handy when A was suffering from an earache. We warmed the cute heating pack up (just a few seconds in the microwave...it couldn't be easier!) 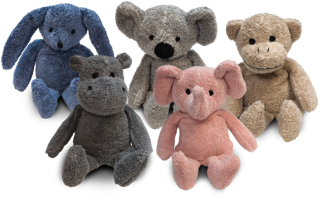 and she curled up on the couch with the bear against the side of her head and it wasn't long before she was feeling much better:) These heating/cooling packs in stuffed animal form are perfect for all-natural comfort and relief for the kiddos. The medium sized pack would be perfect for headaches, muscle aches, and a variety of other pains and would also be a great, safe heating source for those chilly nights curled up on the couch:) These Thermal-Aid products would be fun gifts or stocking stuffers this holiday season! ABCD Diaries gives Thermal-Aid an A+!